Free tourist visa to Korea? Last Wednesday, July 1st, the Ministry of Justice in Korea announced “free tourist visas”. Many were excited about the announcement that it caused confusion as to what really is free tourist visa to Korea. The article is entitled “Tourists to benefit from more lenient visa rules“. Kim Young-june, commissioner of the Korea Immigration Service, part of the Ministry of Justice, announced that mainland Chinese tourists can benefit from free tourist visas over the next three months, between July 6 and September 30. He was speaking at a foreign press briefing at the Foreign Press Center Korea in Seoul on July 1. Kim said, “The benefits will also be applied to tourists from Vietnam, the Philippines, Indonesia and Cambodia. Also, three-month tourist visas issued between March 1 and June 30 can be extended, allowing visitors to stay for as many as six months.” Tourists on such visas will not need to visit an immigration office to have their visa extended, even if the date on the stamp has expired. The Ministry of Justice also announced that it will give permission to tour groups from mainland China to enter the country without any individual visas. The new measures will be especially useful for Chinese group travelers who are planning to visit both Korea and Japan, because they are now allowed to visit Korea, needing only a Japanese tour group visa. Tourists who visit Korea with a tour group visa for Japan can stay in Korea for a maximum of 15 days. What is exactly the benefit? Free tourist visa between July 6 and September 30 ~ in Tagalog, “libreng tourist visa”. Libre naman talaga ang visa para sa mga Filipino hangang 59 na araw. Ang may bayad ay ang 60-day visa. Iba po ito sa “visa free” na ang ibig sabihin ay hindi na kailangan ng visa. Ang mga Pilipino ay kailangan pa rin ng visa sa pagbisita sa Korea. Who benefits? Chinese tourists ~ as well as tourists from Vietnam, the Philippines, Indonesia and Cambodia. Other benefit? Three-month tourist visa issued between March 1 and June 30 can be extended for up to six months ~ ibig pong sabihin yung mga nabigyan ng visa noong March 1 hangang June 30 ay pwede nila i-extend ang visa ng hangang anim na buwan kung hindi pa sila nagbi-biyahe sa Korea. Matatandaan na maraming natakot pumunta ng Korea dahil sa MERS. Halimbawa, nag-apply at nabigyan ng visa noong March 1 ~ sa loob ng tatlong buwan dapat gamitin ang visa pero kung hindi natuloy ang biyahe sa panahon na yun, pwede pa rin gamitin ang visa kahit paso na ‘to. Di na kailangan mag-apply ng panibagong visa. Here is the announcement from the Korean Embassy in the Philippines. 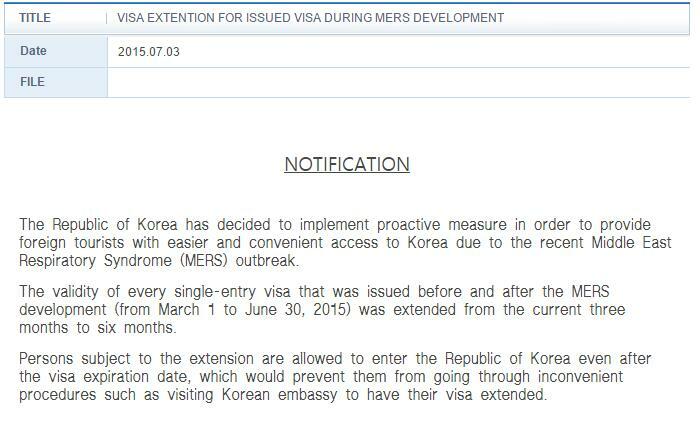 It is clear that Filipinos still need to apply for tourist visa to visit Korea. Again, free tourist visa means not having to pay for the visa. It DOES NOT MEAN BEING ABLE TO ENTER KOREA WITHOUT A VISA. Starting July 1, 2015, all visa applicants who have travelled as tourist to Korea at least once within 5 years will be exempt from submitting ITR copy. Processing time will also be reduced to 3 working days. They are still required to apply at window 1 or 2. Those who have travelled to korea once within 5 years with purpose other than tour such as business, church visti, family visit, are still required to submit ITR copy. They are required to apply at window 1 or 2. Processing time is 5 working days. Those who have travelled to Korea more than twice within 4 years are exempt from submitting ITR copy and may apply at window 3(frequent travellers). That’s one less requirement for those who’d like to visit Korea AGAIN! May question po ako..kase po i was married with koreanv i was granted with spouse visa and stayed in korea for quite some time but sadly after nearly 2 years of marriage nag divorce kami sa korea and i went back to the philippines at sinurender ko na yung alien card ko..now po gusto ko sana bimalik sa korea para lang i visit yung mga friends and chirch na inattendan ko when i was there ano kayang klaseng visa yung pwede ko kunin para makavisit ako sa korea ulit. Please help po im confused eh and i really want to see my friends in korea again. Hi! Apply for a tourist visa ~ that’s the purpose of your visit. You should provide them the requirements: Certificate of Employment, ITR, bank statement, invitation letter. Hi.. ask q lng po kung my ibng way pra mkkuha aq ng visa.. wala n kc aq work since 2012.. gusto q sna ivisit ang asawa q n ofw sa korea.. may chance kya n mkpasyal aq don? Thanks..